Just like the “co-dependence” of Sales and Marketing is a good thing, in the context of sales enablement, being a true enabler is a good thing! Sales enablement is an increasingly hot topic around the industry, but the meat of it has been around for a long time. Historically, much of what we now call sales enablement was a product marketing function. But this function has broadened in recent years within many organizations. Often, a Sales Enablement Specialist, or a team, now bridges the Sales and Marketing organizations. rvices training, other examples of tools for a Sales team might include specialized seminars or workshops, scenario trainings in a group setting, on-demand web-based training, and a detailed new rep onboarding plan. 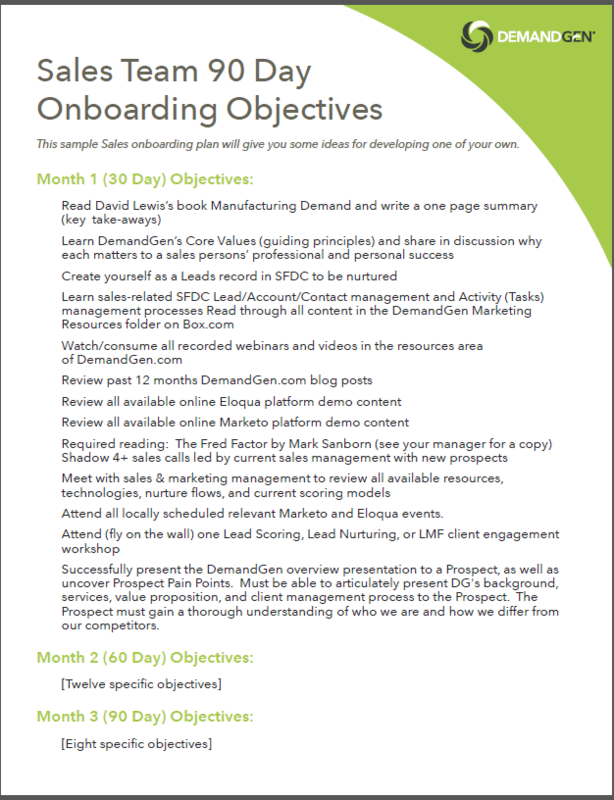 To give you an example, at DemandGen we’ve recently revamped our onboarding process for new sales reps. The company’s rapid growth means we need our sales reps to ramp up fast, so we created a set of key objectives that we want to see a new rep accomplish in their first 90 days with the firm. The idea is to provide new reps with a structured plan oriented around specific tasks that a new rep should pursue and complete to facilitate their early education at DemandGen. The reps love having the guidance on how best to immerse themselves in the business and the market. Here’s an example of our New Rep Enablement Checklist. 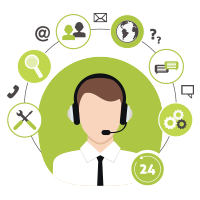 Technologies such as predictive lead scoring and contact data appending solutions offer the ability to search on a given Lead to find others at the same company who match our target customer profile, and easily populate those individuals into the CRM. Inbound Marketing Profile information and Lead Scoring that aids in visualizing “data within the data” and gives the sales team greater access to the true benefits of the CRM and marketing automation systems. Leads can be dropped right into various nurture tracks based on role and responsibility, which are personalized with the rep’s name and contact info, so that the rep begins to develop a relationship without manually reaching out to all those people. Reps increase the probability of finding active opportunities by leveraging the sales enablement module of the marketing automation system (such as Eloqua Profiler or Marketo Sales Insights) to track Lead activity related to nurtures as well as meaningful interaction with all our marketing communications and events. Social selling solutions (such as LinkedIn and Hootsuite) help reps build their professional networks and discover how they are connected to potential customers. These tools can also help reps understand when their competitors are involved, and how those competitors may be connected to those potential customers as well. As we all know, Marketing’s goal is to deliver a constant flow of quality leads to Sales. As such, the goal of Sales Enablement should really be to help Sales make the most of the leads Marketing is delivering. Your Sales team can gain tremendous insight into their Leads by evaluating the digital body language that’s being aggregated by your marketing automation platform—but only if they can get access to it! That’s why tools like Eloqua Profiler and Marketo Sales Insights are so important. They bring that critical information into the CRM system where your reps spend a significant portion of their days, helping to guide them toward the most likely topics for a meaningful conversations with their Leads. 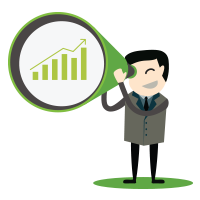 Sales enablement improves Sales’ ability to target successfully. For instance, at DemandGen our Marketing team focuses on targeting contacts at businesses that have certain technologies in place, are the right size, and are in the right geographic region. Within the CRM, our reps might look at a given territory and see where several individuals from the same company are consuming our content, based on their web activity, interaction with communications, event attendance, and so on. This approach enables the reps to prioritize their Lead follow-up and selling activities so they stay focused on Leads that are more likely to move into the pipeline. A key function of Sales is building lasting relationships. Implementing a solid Sales enablement strategy should be all about giving your Sales teams the tools they need to foster meaningful interactions with Marketing Leads and help those Leads build strong, enduring relationships with your brand. Adam P ierce, Senior Manager of Sales, helps demand marketers build long-lasting relationships with DemandGen. With more than 15 years of experience in B2B and B2C sales and sales management roles, Adam also contributes unique expertise in sales enablement and sales training.